by California artist Jackie Jacobson transformed into a beautiful ceramic tile coaster. Palm trees and Palm Springs. The perfect image for an artist living and displaying in the Palm Springs area. This row of palm trees is very special because of it’s inhabitants. Look closely and see the birds painted with their nest. 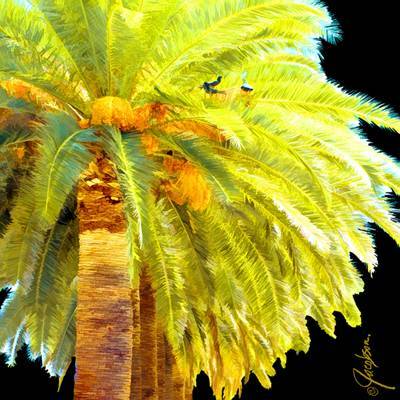 This Palm Tree was their home, and that needed to be shown in the palm tree painting.